The American Redoubt has many components — political, philosophical and religious. But if there’s one element the movement needs to exist, it’s land. For the past several years, Todd Savage has been doing good business providing Redoubt adherents with exactly that. Operating under the banner American Redoubt Realty, Savage specializes in connecting clients to ideal properties for self-sufficiency — or maybe, just maybe, surviving the calamity known in Redoubt circles as The End Of The World As We Know It. “A day scouting property with a client in the Yaak River Valley, Montana.” -Todd Savage. One of the more visible members of the American Redoubt, Savage came to national attention in 2016 when he was included in a Washington Post profile of the movement. Outspoken, frank and rarely without a firearm close at hand, he fits the popular image of the Redoubt faithful. Savage makes no apologies for lifestyle decisions that might shock coastal sensibilities, like the loaded rifles he keeps in easy access near his children’s bedrooms at their off-the-grid homestead 18 miles east of Sandpoint. “We moved here because we wanted to be around folks that were libertarian/liberty minded like us and identified with the goals of being self sufficient and prepping,” he wrote in an emailed response to questions. In many respects, Savage’s journey to the Inland Northwest mirrors the that of the clients he now serves. In the early 2000s, he and his family enjoyed an affluent life in California but were disturbed by what they perceived as a transforming culture. 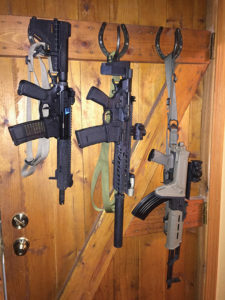 “One of our doors at home, next to the children’s bedroom so they can have fast access to them. Yes, they are loaded.” -Todd Savage. Photos courtesy of Todd Savage. In 2003, Savage experienced a fateful meeting with James Wesley, Rawles (sic), the novelist and blogger credited with launching the Redoubt in a 2011 blog post. If 2011 was the formal birth of the Redoubt, however, Rawles was planting its seeds long beforehand. He advised the family to give up urban comforts in favor of a more sustainable lifestyle. The Savages’ exodus from California established a blueprint for helping clients with similar priorities. “Those we have interacted with have fled their old locale due to rising crime rates, taxes, aversion of the political environment, inability to home school their children, own and carry firearms at their discretion,” he wrote. But finding the perfect homestead is no simple task. Savage provided a five-page document they send prospective clients to gauge their needs and priorities. 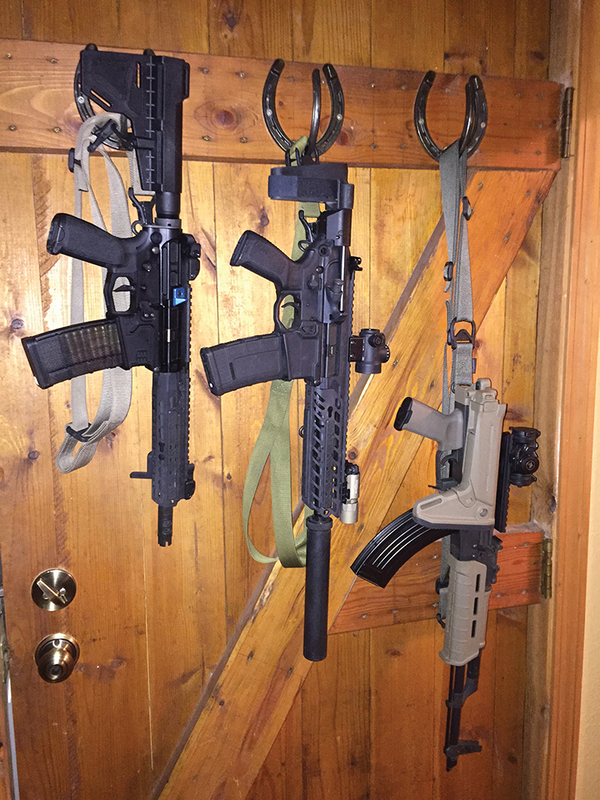 It covers everything from sun exposure to heating methods to the availability of rifle and pistol ranges, as well as other concerns like acreage, distance from towns or emergency services and home style. As is often the case with real estate deals, reconciling the reality of price ranges with the dream home is often an issue. One thing is for sure: There are enough people interested in putting Redoubt principles in action to keep business humming. Savage estimates his office works with 2,700 revolving clients a year who are interested in a move to a Redoubt state — eastern Washington and Oregon, Idaho, Montana and Wyoming. Of that number, about 75 to 80 per year make the move. Savage said approximately 70 percent of that number move to North Idaho and the rest to Montana, with a handful choosing Wyoming instead. As for the cultural and political ideas that animate the Redoubt, Savage said it’s all about guns, God and freedom. Frustrated with the tenor of mainstream politics and a perceived overbearing nanny state, Redoubt adherents see the western states as a last bastion of a libertarian lifestyle. The growing political influence of the American Redoubt has provoked cries of alarm from many Idahoans, Republican and Democrat alike. But to Savage, the political energy that underpins the Redoubt isn’t wielded as a weapon. He sees it as a defensive measure shielding a rapidly disappearing American way of life.